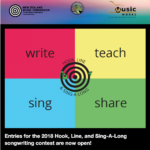 Entries for the 2018 Hook, Line, and Sing-A-Long songwriting contest are now open! Your song learned in schools all over New Zealand and sung in our massive Sing-A-Long on the last day of NZ Music Month, May 31.
hooklineandsingalong websiteWRITE a fun, catchy song that kids all around NZ could sing along to! Students up to age 19 are eligible to enter, but get going fast because entries close on March 18. Make sure to read our Song Guidelines and Terms and Conditions, so you know how to write a great song. The winning song for 2018 will be announced on March 27.